A Google Street View of a cow grazing near the River Cam in Cambridge, England has caused a bit of an uproar on Twitter. There's nothing extraordinarily different about this cow, other than its blurred face. 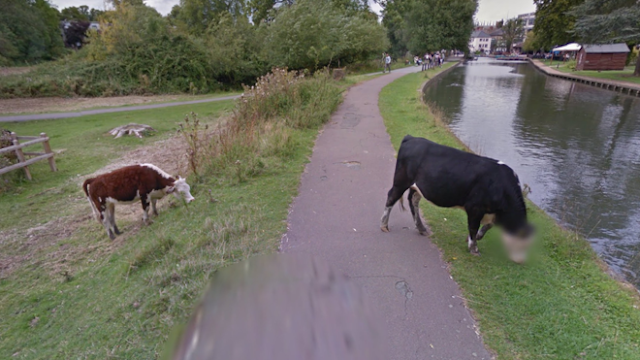 It appears that Google cares more about cows than previously thought. For the most part, Google Street View is good about protecting the privacy of those stray humans among us who just happen to be around when the funny Google car drives through. Providing panoramic views of the area, it could definitely pose a risk to people not wanting to broadcast sensitive information to anyone accessing Google maps. By default, people's faces, license plates and architecture, in some cases, are blurred out to preserve privacy and protect identities. Houses can be blurred on request. In the case of the blurry-faced cow, it was Guardian's David Shariatamadari who first noticed Google's silent advocacy of cow rights (as seen above). He tweeted his findings and has since gotten nearly 13,000 retweets and over 16,000 likes. We thought you were pulling the udder one when we herd the moos, but it's clear that our automatic face-blurring technology has been a little overzealous. Of course, we don't begrudge this cow milking its five minutes of fame.